Although most people think of BBQ when they think of the Carolinas, it’s not the only thing Raleigh does well. Raleigh has quite a few options for pizza that go beyond your traditional choices. Try an all-organic pizza or a kale and cheddar pizza, or you can stick with a traditional New York-style pizza joint. These top pizza places will have you coming back for more. Dante’s Italiano is far more than just pizza. This authentic Italian restaurant offers delicious appetizers like bruschette di cabra, a caprese mozzarella salad, and traditional Italian entrees. It will be hard to pick what to order between those entrees and the stone-baked pizzas that Dante’s does so well. 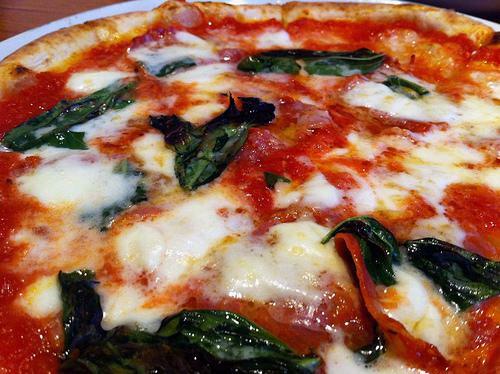 Dante’s offers traditional pizzas or you can try one of their signature pizzas like the Parma Verdi or The Godfather. Lilly’s Pizza is delicious, but that’s not what makes it stand out the most. The restaurant only uses certified-organic, local ingredients including whole wheat stone-milled flour from Graham, North Carolina. All of their proteins are prepared fresh every day and contain no added hormones. With two locations, you can check out hotels in Raleigh or Durham to put you close to the best organic pizza in the area. If you haven’t tried this pizza chain, it’s time to make a stop at the three outside of Raleigh or patiently wait for the one opening in Durham. This restaurant, backed by Lebron James, is essentially Chipotle for pizza. They make their dough in-house and then you pick the fresh ingredients you want on top. They throw it in their oven, and you have your artisanal, piping-hot pizza about three minutes later. After doing some shopping at Cameron Village, head to Tazza Kitchen to enjoy one of Raleigh’s best brick-oven pizza. This trendy restaurant has an eclectic menu that centers around their brick oven. Start off with brick-oven Brussel sprouts or brick-oven nachos, and then move on to the brick-oven pizza. These pizzas aren’t your typical pizza. Try the kale and cheddar or the white pizza with béchamel, parmesan, fresh mozzarella, caramelized onions, and bacon. Tazza Kitchen is also worth trying out for brunch as well. Peri Brothers is a no-frills pizza place that does New York style pizza really well. The pizza slices are huge in New York-style fashion, and the other items on the menu aren’t too shabby either. Start out with the fried calamari and garlic knots. Then consider trying the Hell’s Kitchen Pizza with pepperoni, sausage, meatballs, and hot peppers. If you’re in an adventurous mood, you might want to try the Southern Pie with bacon, chicken, and ranch. Peri Brother’s offers pizza by the slice, takeout, and dine-in options. Raleigh can rival the best cities for pizza with all their options. Drive around Raleigh, and you will find pizza places that suit every taste. You can get takeout pizza fast or sit down and have a nice dinner with the family with all the options Raleigh has to offer.